Summary: Before John Glenn orbited the earth, or Neil Armstrong walked on the moon, a group of dedicated female mathematicians known as “human computers” used pencils, slide rules and adding machines to calculate the numbers that would launch rockets, and astronauts, into space. 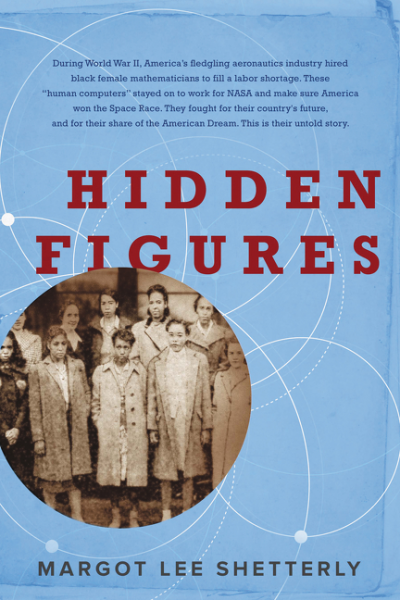 HIDDEN FIGURES: THE AMERICAN DREAM AND THE UNTOLD STORY OF THE BLACK WOMEN MATHEMATICIANS WHO HELPED WIN THE SPACE RACE by Margot Lee Shetterly is truly a remarkable story. I don't often read non-fiction, however, when I heard the premise of this book, I knew it was one I had to read. HIDDEN FIGURES tells the story of an amazing group of women who were mathematicians for the Langley Memorial Aeronautical Laboratory (the early days of what is now known as NASA). What makes this story even more intriguing is that these women, who were known as "human computers" were African American! During the labor shortages of World War II, the aeronautics industry needed individuals who could do some serious calculations -- calculations that would send rockets and eventually astronauts into space. They needed people with major math skills so they looked to black women who were teaching in the public (and segregated) schools. Keep in mind that this is before computers and these women were computing with slide rules and adding machines! It's unbelievable to me! I found HIDDEN FIGURES to be an absolutely incredible book. Not only were these women doing very important work in the 1940s when women weren't exactly considered equal in the workforce -- they were basically hired because the men were fighting in the war, but they were African American women! They weren't even allowed to use the same bathrooms or sit at the same tables in the cafeteria. Mind boggling, right? The author does a terrific job of telling the personal stories of some of these women, and I have to admit that I probably enjoyed these parts of the book a little bit more than the details about the aeronautical industry. Although, I will admit a very interesting aspect of this book was learning how the space program evolved from its relatively humble beginnings. However, there were times when I found all of the details about the Space Race to be a little dry -- I'm just not all that interested in the subject matter. But these women! Wow -- they were incredible... and pioneers for all women. Their contributions to the space industry are huge, but as a woman, I also respect just how much they paved their way for working mothers. These women had to balance the work/family thing before there was even a term for it. In many cases, they were the primary breadwinners for their family as well as the glue that kept their families together. I promise you that HIDDEN FIGURES is truly an inspiring story! I also want to give credit to Ms. Shatterly for telling these women's stories. I can't believe that I had never heard of these "human computers," and I suspect I'm not alone. It's obviously a story that is near and dear to the author's heart. And it's apparent that Ms. Shatterly did an ton of research to bring this story to the pages of this book. HIDDEN FIGURES is soon to be a major motion picture starring Taraji P. Henson, Octavia Spencer, Janelle Monae, Kirsten Dunst, and Kevin Costner. Now, that's a cast! After reading this book, I am more excited than ever to see this movie. I have a feeling that the movie version of this story will includes the parts of the book that I enjoyed the most -- the lives of the women and their successes as well as their struggles. I doubt I'll go on Christmas Day when it's released, but as soon as the kids are back in school, I'm sure my friend and I will see this on a $5 Tuesday! I found it interesting that Harper Collins is publishing a Young Reader's Edition just in time for Christmas. I would love for my son to read about these brilliant women... and my daughter too for that matter. There is a teacher's guide available that is outstanding. There are discussion questions by chapter (at least three per chapter) as well as some writing prompts. I would love to see this book discussed in middle and high schools because it is such a fascinating time in our country's history. Actually, I think reading HIDDEN FIGURES would benefit all Americans, and I think it would make a terrific book club selection. Some of the themes you might want to explore include racism, segregation, the role of women during the war, family, sacrifice, the balance between work and family, the space race, the civil rights movement, and confidence. Overall, HIDDEN FIGURES is an incredibly interesting and important book. I highly recommend it! This is exactly the kind of book I love. I wonder if I could get my book club to read it and then see the movie.